Ipso’s activities in Afghanistan aim to strengthen the Afghan public health care system by training health staff, psychosocial counsellors, medical doctors and nurses working in primary and secondary health care of selected clinics in all provinces. These activities are in line with the National Mental Health Strategy of the Afghan Ministry of Public Health and aim to reduce the high mental health burden of a population that has been suffering from war and insecurity for the past 35 years. The main causes of mental health problems are traumatic experiences and psychosocial stressors such as family conflicts, migration, loss of beloved ones, poverty and high levels of stress in daily life. Furthermore, daily life is affected by the transition from traditional to modern society through digital globalisation and the influence of the media causing shattered basic assumptions about social and cultural identities. The burden of post-traumatic stress is likely to have a negative effect on family interaction and other social relationships, often causing problems such as social isolation, an increased likelihood of drug abuse as well as conflicts in families and communities that lead to domestic and other forms of violence. Such problems often have a severe negative impact on the developmental perspectives of children and adolescents, including their education and personal rights, lessening their chances to escape poverty. Somatisation of such these problems frequently leads to an increased higher consumption of medication. With the psychosocial counselling services being integrated into Primary Health Care the underlying problem of the somatic symptoms can be addressed and the patient can be supported through a resource and problem solving counselling approach, which fosters psychosocial wellbeing in a culturally sensitive way. These counselling services have several positive results such as fewer chronic patients, positive impact on addiction problems, a decrease in domestic violence, and reduced numbers of suicidal attempts. The promotion of supporting peaceful solutions for family conflicts and a positive impact on people’s outlook on life are further results of the psychosocial services. The training of psychosocial counsellors working in the Public Afghan Health Service is based on a manual that was developed by Inge Missmahl, the founder of Ipso, and her team. It has undergone periodical reviews based on field experience and now serves as a training resource officially approved by the Ministry of Public Health. Additionally, a Learning Resource Package (LRP) for the training of psychosocial counsellors has been developed and was approved by all institutions within the MoPH. Afterwards it was translated into Dari and Pashto, printed and is being used now all over the country. Up to date 180 psychosocial counsellors from all provinces of Afghanistan have received a one year training including on the job training and are now working as Professional Psychosocial Counsellors within health facilities of Afghanistan. They directly contribute to increasing the capacity of the Afghan mental health services, by providing culturally adequate counselling services to the population in need. In order to improve the capacity of the health staff and the teamwork between the newly trained Counsellors and the Medical Doctors (MD) we trained a total of 180 MDs and nurses from all provinces in bio-psychosocial mental health care. The training followed the Learning Resource Package for MDs and nurses, which were developed by Ipso and endorsed by the MoPH. 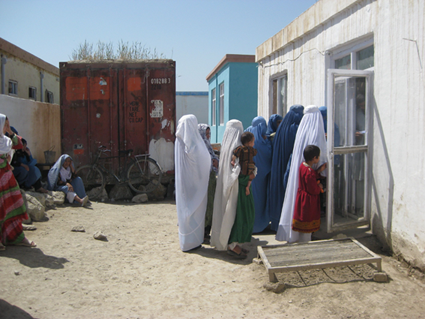 Since the total amount of mental health specialists needed in Afghanistan cannot be trained within the framework of our action, we also focused on training multipliers who will then be capable of running trainings for staff working in public health care and social institutions in their provinces on mental health care confidently and independently. Therefore, the best of those trained Psychosocial Counsellors and MDs were selected to be trained as National Mental Health Trainers in order to train the mental health staff for further health facilities in Afghanistan. Our trained National Mental Health Trainers already conducted one training in cooperation with Merlin, the BPHS implementing NGO in Kunduz and enabled 10 Afghan men and women to work as Psychosocial Counsellors within health facilities of the districts of Kunduz. The whole Ipso projects are sustainable, because the counsellors are handed over to the health system and continue to work in their respective health facilities. Overall the Ipso trained Psychosocial Counsellors have treated all over Afghanistan in the last year: 49 911 persons in individual talks; they conducted 4335 open therapy groups with 51687 participants and gave awareness to 308 100 persons during 15 915 sessions. Dr Fareshta Queedes’ (Head of Ipso Afghanistan) experiences with one of the mental health projects. The success of psychosocial counselling in Afghanistan.